To say people in Dallas freaked out when In-N-Out Burger came to Dallas would be an understatement. Folks camped out over night. Others waited in crazy long longs. And some were even brought to tears. Yes tears. All to be one of the first to wrap their hands around one of those tasty In-N-Out Burgers. Crazy, huh? But not everyone goes Ga-Ga for In-N-Out. 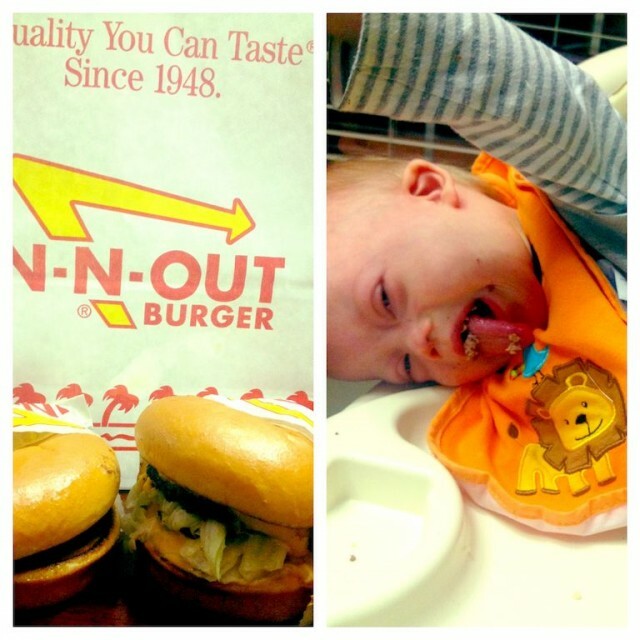 The first time we brought Noah to In-N-Out burger he was still drinking from a bottle so he didn’t get a chance to try out one of the hamburgers. But now that he can self-feed we decided to give him a little (unhealthy) treat for dinner. And as you can see in the video, he wasn’t much of a fan. I guess we should consider it a good thing that he isn’t a fan of hamburgers, maybe we’ll stick to more healthy things like Tim Tams. Oh and by the way, we don’t feed our son hamburgers, chocolate, and smash cakes every meal, I promise. But come on, it wouldn’t be nearly as interesting if I just posted videos of him eating organic baby food and apples now would it. It’s all about balance. What foods does your child absolutely hate eating? What’s one of their favorite things to eat, that they shouldn’t be eating? (And don’t worry, there’s no judging here.) Leave a comment below and tell us about it.